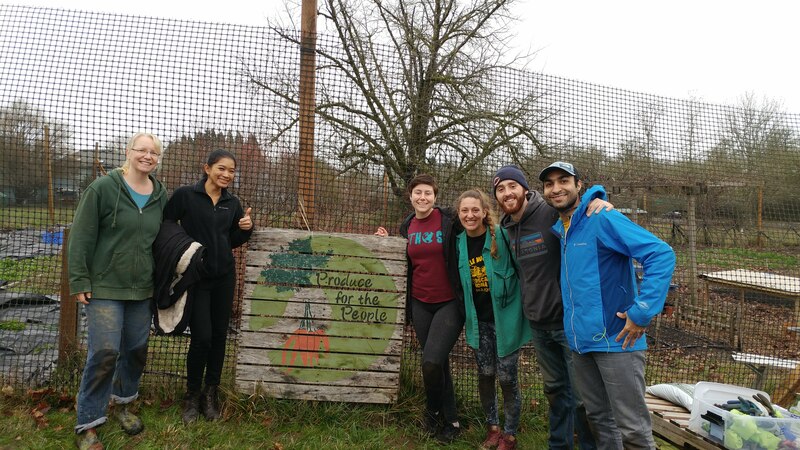 On Saturday, January 19, 2019, graduate students and Dr. MacCarty from the OSU Humanitarian Engineering Lab volunteered at Benton County’s “Produce for the People” as part of the Martin Luther King Day of Service. An annual event that honors the legacy of Dr. King, the MLK Day of Service offers a wide variety of service opportunities for students, faculty, and Corvallis residents, with the mission of building community. One such service opportunity was gardening with Produce for the People, a non-profit organization that started through a partnership with OSU and funded by the National Institute of Health. What began as a short term research project investigating the impact of community gardens on the health of low-income Latinx residents developed into a 13,5000 sq. ft. garden that produced over 4000 lbs of produce in 2017. In addition to providing garden plots for individuals, Produce for the People donates food to local agencies including the South Corvallis Food Bank, Community Outreach, and soup kitchens. For the day of service, Humanitarian Engineering volunteers from the got their hands dirty cleaning the fields for tilling and weeding, while other volunteers cleaned plant pots for reuse and carried mulch for planting. Produce for the People operates year round, and are seeking volunteers of any age and gardening ability. Times for volunteer work parties are listed on their Facebook page: https://www.facebook.com/pftpgarden/. 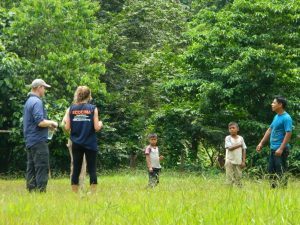 One of my favorite memories of Guatemala is of playing soccer with some of the kids from the second village we visited. It was raining, and the field was half mud, but we played a pick up game (organized with very rudimentary Spanish and hand gestures) with three little boys and our guide, Katie, who was 10. Despite the haggard conditions of their field and the ball, which was kicked one too many times down a steep ditch and into the woods, it was a great game. I can’t remember who won, but I do remember that we all had a good time playing soccer. It was also so exciting to see and interact with some of the people that these cookstoves and interviews and research are all aiming to help. Their potential and enthusiasm to succeed is so great, and should be unencumbered by a lack of transportation to school, or having to wonder how they will one day feed and support a family. Hopefully, our research will help with that. The picture below is some of us trying to negotiate a soccer game.